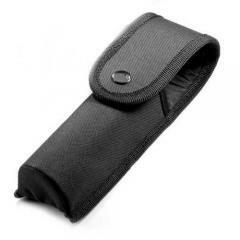 The Streamlight 76090 Nylon Holster for Streamlight Stinger Rechargeable Flashlights provides a durable and handy way to keep your flashlight at the ready. Streamlight accessories and replacement parts are specifically designed to deliver the best performance from your Streamlight Flashlight without compromising quality. Streamlight Stinger Rechargeable Flashlights have been the choice of law enforcement personnel for years, and are the choice of police departments for their reliability, durability and long life. Is this holster open at the bottom?